Manny Pacquiao avenged his loss to Timothy Bradley tonight in Las Vegas, earning back the WBO welterweight belt. But the real winner of the match was Manny's mom, whose, uh, enthusiastic praying led many observers to question if she was putting a hex on Bradley. 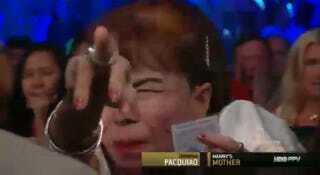 Pac-Man won by unanimous decision.